When you came home from work and the kids come home from school, where do you all hang out? If it happens to be the kitchen, then your family is a part of a growing trend. The message from home designers all over the country is that today’s new homes have bigger kitchens, bigger than ever before. In fact, average kitchen sizes have grown an eye-popping 300 square feet. But just what are the reasons kitchens are getting so big? Experts point out that more of us are staying home and cooking, either because it is healthier, it saves money and because it is fun. One should note that cooking is no longer viewed as a chore, rather as a hobby and expression of a skill. Also, experts point out that kitchens are bigger because it has become the room in which we choose to entertain. Surveys show that some families spend as much as 90 percent of their waking time in the kitchen when they are at home. And if we were to guess, we would say that come Christmas, there will be friends and family gathering and hanging out in your kitchen. If your kitchen doesn’t look as good as it should, perhaps it is time to have quartz countertops installed by A Polished Finish in Atlanta. 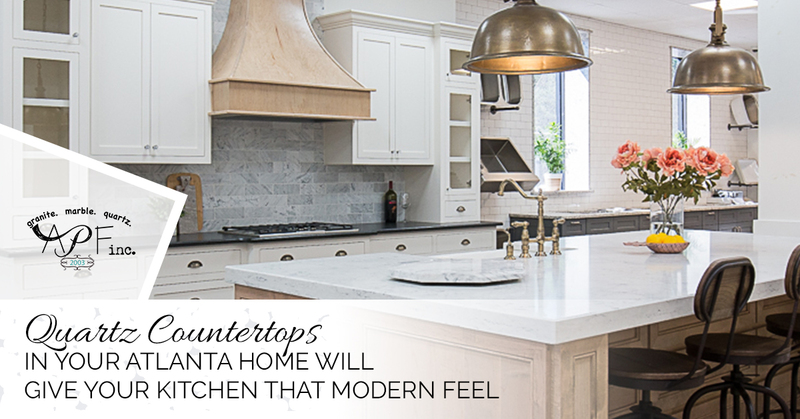 After all, you want your kitchen looking great for your holiday guests. If you were wondering, here are the reasons why your kitchen is the most important part of your house. Think about it; your day begins in the kitchen where you brew coffee and poach some eggs and your day ends in the kitchen as well. In fact, there is never a day that you don’t have a reason to enter the kitchen. Just think about the number of times you walk into your kitchen for no reason than to open up the fridge and peak at what is in there. You are just drawn to the kitchen. All of the groceries you bring home from the store wind up in the kitchen. From there, it all gets shuffled into the refrigerator, freezer or any number of cupboards you have in the kitchen. Since the kitchen is where the food is stored and prepared, then it makes sense that you spend a lot of time there. After all, food is essential to our survival. As we discussed earlier, the kitchen has evolved over the years. At one point, the kitchen was a small space behind closed doors, it has now become a large room with plenty of open space. The kitchen has become the place where you can keep an eye on the kids while prepping a meal. It is the place you keep your laptop and read the news websites and it is the place you sip your morning coffee while listening to Morning Edition on your iPad. The kitchen is the pace your kids perch to practice their multiplication skills and write their “what I did last summer” essays. The kitchen is also the place you dole out your kid’s very first list of chores, which happens to include cleaning the dishes and sweeping the kitchen floor. Let’s face it, with iPads, laptops and smartphones, you have several ways in which you can watch movies or binge television shows. You don’t have to be stuck in the family room in front of the TV to entertain yourself. The kitchen is now the place where the family gathers to play board games or to engage in their hobbies. In fact, many of our hobbies, like the art of cooking or brewing the perfect beer, are played out in the kitchen. In the 20th century, we mixed Tom Collins and Harvey Wallbangers in the den and served them in the living room. The spouse was quick to offer up plated hors-d’oeuvres to guests seated on the floral print plastic sofa in the living room while smiling nervously as guests recklessly sipped red wine on the white shag carpet. Today, we gather in the kitchen for home-brewed beer and Highballs. If you desire a kitchen with more style and class, call A Polished Finish.